In Eastern Ukraine (including Luhansk and Donetsk regions) there are a lot of large areas of natural landscapes and unique nearly-pristine ecosystems rich in endemic species. In 2014, significant part of this territory became a conflict zone where heavy military weapons and equipment are used. Officially this area is described as “zone of antiterrorist operation” (ATO zone). This assessment of current environmental impact within ATO zone is a preparatory stage for further activities to minimize negative effects on wildlife and restore this regions’ natural capacity. Our study reveals the extent of burned vegetation in the ATO zone during the period from 1 June to 30 September 2014. The study was conducted during natural dry periods, that were accompanied by the most active spreads of fires. We also mapped registered points of fires in natural and agricultural landscapes in the ATO zone in the previously mentioned period in order to model their localization. This model allows estimating proportion of natural landscapes affected by fires. We used the following available input data in our research: database on thermal anomalies location based on MODIS (remote sensing data from NASA service); data from Landsat8 GlobalFiresI RS data MODIS, processed by SCANEX R&D Center and published on the web resource www.fires.kosmosnimki.ru. For the landscape research we used detailed forests map (the information was obtained from VISICOM company, scale 1: 50,000) and steppes (from the spatial steppe database prepared by activists of the “Save Ukrainian steppes” campaign). The ATO zone was outlined using information from National Security and Defense Council of Ukraine. 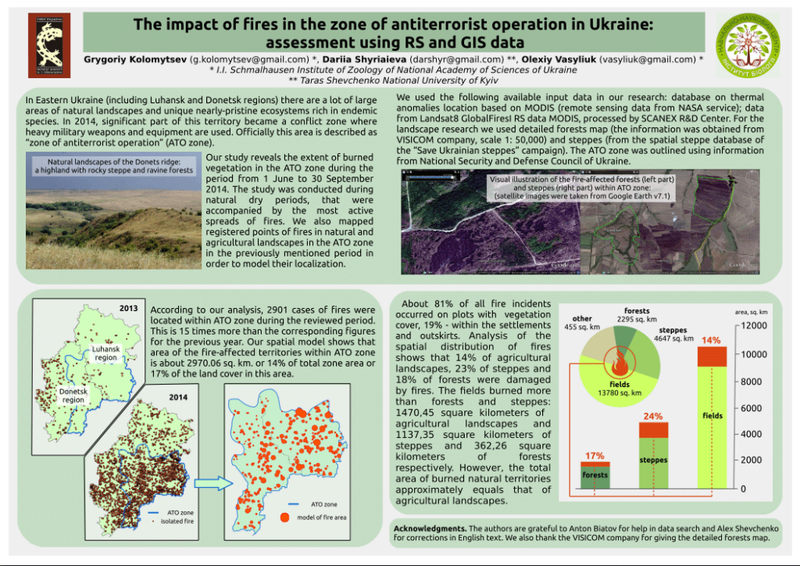 According to our analysis, 2901 cases of fires were located within ATO zone during the reviewed period. This is 15 times more than the corresponding figures for the previous year. About 81% of all fire incidents occurred on plots with natural vegetation cover, 19% – within the settlements and outskirts. Our spatial model shows that area of the fire-affected territories within ATO zone is about 2970.06 sq. km. or 14% of total zone area or 17% of the land cover in this area. Analysis of the spatial distribution of fires shows that 14% of agricultural landscapes, 23% of steppes and 18% of forests were damaged by fires. The fields burned more than forests and steppes: 1470,45 square kilometers of agricultural landscapes and 1137,35 square kilometers of steppes and 362,26 square kilometers of forests respectively. However the total area of burned natural territories approximately equals that of agricultural landscapes. These figures indicate significant and, in some cases, irreparable damage to nature in ATO zone. We look forward to have possibility to verify results of current assessment in field in the nearest future and to join effort to restore the natural value of this territory.